Marissa Labate went from a trauma nurse to a trauma patient — in the very same Sharp Hospital unit in which she worked. She was barely able to move for six months. It took her almost a year to get back to work. But she refused to slip into despair. Now 16 months after her accident, the San Carlos resident is back working in the intensive care unit. She continues the blog started in the middle of her recovery, Lipstick and Lifesaving, as a way to share her journey and connect with other nurses and survivors. Labate came to Sharp Hospital straight out of nursing school. She was one of 18 applicants chosen out of 1,200, and got one of three spots for the surgical intensive care unit (ICU). The ICU was the self-called adrenaline junkie’s personal request. That attitude carried over into her hobbies as well. Why go on a casual hike when you can take on a challenging one? That was one of the reasons Labate and one of her coworkers set out for the graffitied and off-limits Adobe Falls in June 2016. They actually ended up above the waterfall, near a dropoff, instead of at the bottom. As they looked for a way to climb down, Labate slipped and started to slide headfirst on her back down almost 20 feet of rock. Labate had split her browbone open, broken her left wrist, and shattered her right leg into 15 separate pieces, including a crushed tibial plateau. She had to wait 10 minutes for a helicopter to come and get her — what Labate refers to as a very long 10 minutes — and take her to the same place where she clocked in every night. Labate didn’t get from the bottom of the cliff to the top of Burj Khalifa (where her latest celebration travel took her) without the help of her roommate, best friend and fellow Sharp nurse Danae Mucher. Mucher was at home the day Labate fell. She received a call from Labate’s mother, who lives in northern California. 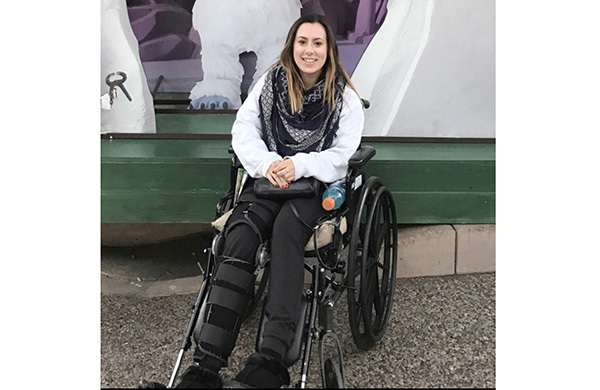 Mucher called her own mother to drive her to the hospital, and walked into “crazy chaos.” Labate had reached the hospital by about 3 p.m., had surgery about 8 p.m., and woke up with a metal bar in her leg and incredible pain from nerve damage. She calls herself “probably their worst patient” because Labate knew the protocols, and being jacked up on pain meds, had no filter for telling anyone how they were or weren’t doing their job. She spent eight days in the hospital, with two surgeries and an external fixation. Labate experienced allergic reactions to the metal and antibiotics used to combat an infection from one of her incisions. She had an IV for six weeks, and was prescribed meds with a strict time schedule. A third surgery was necessary, and there was a nonunion of the bone and possible bone graft. “It wasn’t an easy course,” Mucher said. The next six months Labate spent in a wheelchair. Labate’s mom moved in for the first three months, and her dad lived with them for the last three months. She couldn’t move anywhere without “intense pain,” and had to have help to do just about anything – from make a meal to get to the commode. Labate is not a sedentary person by nature. To just “exist” in a day was an unknown reality to her. She learned that she had virtually no control over her day, but she could control was her mind. The blog arose out of a need to focus on something other than her pain or lack of activity. It was an idea from a friend from school, and picked up 75,000 readers within the first four months. Labate wrote about her injury, her time as a night nurse, and her other passion — cosmetics. Now the blog serves as a travel journal as well. Once Labate was able to walk, and then drive, she wanted to travel. A year after her accident, she took her first trip to Nashville, Tennessee, for the Country Music Award festival. Since then, she has been to Lake Tahoe, Phoenix, Portland, Hawaii, Egypt and Dubai. “I want to take advantage of the time I have,” she said. Both Mucher and Labate note how the last year has changed their perspective towards their patients (side note — Mucher now works in the same unit as Labate after being around them so much through her accident). Labate agrees, saying she now has a whole new empathy for her patients. Read other musings of Labate on her blog at lipstickandlifesaving.com. You can also follow her and her travels on Instagram @marissalabate. —Freelance writer Joyell Nevins can be reached at joyellc@gmail.com. You can also follow her blog at swbgblog.wordpress.com.